Image caption Barnardo's says children are suffering from not seeing their fathers. Children whose fathers are in jail are being punished by rules which limit visits if prisoners do not behave well enough, says Barnardo's. "It's very hard on the children," said one mother, whose partner was jailed for 21 months when their son was two. The charity says the rules, which apply in England and Wales, are cruel and it wants them scrapped. The Ministry of Justice says it has a "dedicated strategy to help strengthen family ties". Barnardo's points out that the rules are different in women's jails where Ministry of Justice guidance says "children should not be penalised from visiting or contacting their mother because of their mother's behaviour". The rules depend on the Incentives and Earned Privileges scheme which links extra family visits with improved behaviour. Some prisoners are allowed only two visits from family members in a 28-day period but, with improved behaviour, this can rise to three or four visits in that time. The charity was told a year ago that the scheme was under review but says so far, nothing has changed. Barnardo's chief executive Javed Khan has written to Prisons Minister Sam Gyimah calling for the rules on family visits to men in jail to be brought in line with those for women. "We're still waiting and children are still suffering. The government must address this now," said Mr Khan. 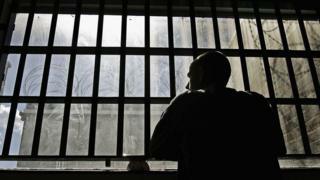 The MoJ said it recognised the importance of families in helping offenders to reform. A spokeswoman said: "We are committed to transforming prisons into places of safety and reform and we recognise the need to provide those in our custody with stable environments, as well as opportunities to change their behaviour and turn away from a life of crime. "Relationships with families can play a key role in this. We have a dedicated strategy to help strengthen family ties, including giving governors flexibility over their budgets to support schemes that help offenders maintain these relationships." "Sarah" says that for most of his time in jail, her partner was limited to three family visits each month. The couple already had a toddler and she gave birth to their second child while he was in prison. She says the visiting restrictions amount to punishing children for their parents' behaviour. "You are in prison because you have committed a crime and because of that you need to be punished. "I am completely supportive of that - but you can't choose your parents. "A child hasn't done anything wrong they are completely innocent in this." Most of the visits were stressful, she says, with queues and searches on the way in. She and her partner sat on chairs that were screwed to the floor and the prisoners were not allowed to get up. It was very hard for the family to interact normally, she says. However, on two occasions, he was allowed "family visits" of up to six hours. There were still searches but the prison officers were out of uniform and the prisoners were allowed to move around. "You could almost imagine you had gone out for the day. "It was a really positive experience. "One was held in a prison gym and allowed the prisoners to walk around, play with the children and the families to eat together at a table. "There was a slide and the children could paint. At another prison, there was a bouncy castle. These visits are less intimidating for the children and make the dads feel more involved."